What is Wesak and what happens during it? According to tradition, Wesak is a time when the Buddha returns to Earth, to bless it. At the exact time of the Full Moon of Wesak, all participants meditate in an ancient geometric configuration to pull tremendous amounts of spiritual energy. In the process, the practitioners are showered with vast amounts of Divine Love, Divine Light and Divine Power. This cleanses the aura and disintegrates negative thought patterns. One comes away feeling refreshed, clear and with a stronger purpose of one’s destiny.The whole ceremonial blessing takes just eight minutes. The Wesak Festival celebrates the world-wide yearly event when Divine Blessings are bestowed upon the whole planet and all of God’s creation thereon, when the full moon is in the constellation of Taurus (usually the full moon in May).Vesak is celebrated in many different ways all over the world. But in essence many practices have become universal. This sacred day is purely a religious festival, and not a festive occasion. It is a day for meditation and for radiating Loving-Kindness. Wesak/Vesak (from the name of the second month in the Hindu calendar, Vaisakha) is the most holy time in the Buddhist calendar. Vesak is also known as Visakah Puja or Buddha Purnima in India and Nepal, Visakha Bucha in Thailand, Waisak in Indonesia, Vesak (Wesak) in Sri Lanka and Malaysia, and Saga Dawa in Tibet. The equivalent festival in Laos is called Vixakha Bouxa. Vesak is a public holiday in many Asian countries like Sri Lanka, Malaysia, Thailand, Singapore, and so on. This date also marks the anniversary of all the momentous occurrences of Lord Buddha’s last earthly life – His Birth, His attainment of Buddhahood, and His departure from the physical body. Lord Buddha undertook to return to the world once every year on the anniversary of his death, shed upon it a flood of blessing. The affects of this outpouring are the expansion of consciousness and awareness for those who are prepared for this occasion. As you participate in the Blessing of Mother Earth, you will also generate lots of good karma that you can share with your family and loved ones. Afterwards, you can bless your projects! It is estimated that meditating during the full moon is equivalent to meditating for several weeks. To meditate during the Wesak Full Moon is equivalent to meditating continuously for several months! Practicing the Meditation on Twin Hearts and the Great Invocation with 7 people is equivalent to over 100 people doing meditation independently. With 1000 or more, like-minded spiritual disciples meditating simultaneously the effect is beyond comprehension. For this reason alone it is worth being a part of the event. Let us do our part to cleanse the consciousness of world leaders & mass consciousness to deal with the threats such as terrorism, war and climate crisis. All aspirants and disciples of future should set aside these seven days of Wesak as among the most holy days of their lives and use them to work upon themselves. These seven days are the three days before the day of Wesak, the Wesak Day and the three days following the Wesak. The three days preceding the Wesak must be dedicated to holy living, purification, sublimation and transformation. On Wesak Day total orientation towards beauty, goodness and truth must be maintained. This is the day of contact. 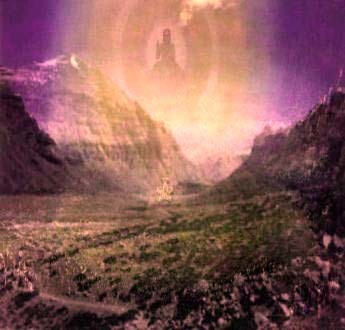 First you contact your own soul; next the eyes of your Master are focused upon you for a second and then you feel the great energies penetrating into your system, causing some degree of transfiguration, after which you will make great decisions to change your life into higher levels of living. During the next three days, you will bless others, you will radiate your love, your compassion to all living beings, to the whole humanity accepting it as a great Brotherhood. As the beloved child of God, if you do this year after year, you will see yourself going towards the sunny mountain of achievement and you will become a life giver of health, love and beauty. In your country, the venue can be any indoor or outdoor place that can accommodate the delegation. The Wesak must be celebrated on the exact date and time. Please coordinate with the GMT time of the full moon. The ceremony and meditation must therefore be started at the exact equivalent local time. A core group of twenty-one (21) people is needed to conduct the ceremony. The 21 are divided into five, seven, and nine. 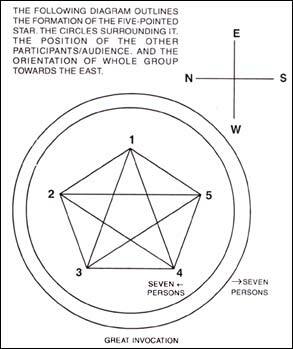 The five innermost persons will be visualizing and forming a golden five-pointed star; the seven will be forming a circle around the first five and will be visualizing and forming a golden circle; and then the nine will encircle the first two groups and will be visualizing and forming a golden circle. The innermost five persons have the responsibility of visualizing the five-pointed star throughout the entire ceremony. Those in the Circle of 7 and those in the Circle of 9 have the responsibility of visualizing the golden circles. All participants should be standing and facing east throughout the ceremony. It is suggested that an accurate compass be brought to determine which direction is East. Additional participants will have to also face east and arrange themselves behind the core group of 21 people. Attire should be preferably white or light-colored. The ceremony shall consist of three Phases. Then everyone chants the OM three (3) times. d. Everyone prays the Great Invocation three (3) times. The five innermost persons should say the prayer aloud. The rest can say the prayer inaudibly but they will have to move their lips. e. Then everyone repeats chanting of the OM three (3) times. a. First everyone chants the OM three (3) times. b. Then, during the activation of the Heart Chakra, the innermost groups of 5 persons all connect their Heart chakras with each other using the golden metallic light. Then they visualize the five-pointed star being formed by the golden rays of light connecting them with each other. The same thing is done with the Crown chakra, and later, with both the Heart and Crown chakras during the appropriate moment of the meditation. c. The circle of seven and nine will also similarly connect themselves, first at the Heart, then Crown, then both Heart and Crown chakras. They will again be visualizing themselves forming golden circles of light. d. The rest of the participants will do the Meditation on Twin Hearts the usual way. e. Then everyone chants the OM three times (3). Phase Three shall be the observance of Silence for a period of not less than three (3) minutes. A timekeeper/timer should be appointed for this purpose. Excess energy can be released by blessing and physical exercise. The core group of 21 people should practice the ceremony mentioned above, specially the visualization of the five-pointed star and the golden circles during the Great Invocation and Meditation on Twin Hearts. There should be at least one or two practice sessions before doing the actual ceremony. One session should be a rehearsal at least five (5) hours before the actual ceremony, at the actual venue. One or two persons can be designated to lead the whole ceremony. Yellow chalk or some similar markings can be used to draw on the floor (or ground) the star and the circles. Other Arhatic Yogis, pranic healers, pranic healing licensees and sub-licensees, and anybody else who expresses an interest in participating in this special meditation, are requested to celebrate the Wesak in manner described above in their respective cities or areas. Let us invite everyone to help heal the world by participating in this special Wesak Festival.